WSM members & supporters in northern Ireland provided live coverage of the N30 Pension strikes via our Twitter feed. Anarchists in Derry put a banner up in the city centre in solidarity with today's strike and a WSM leaflet (below) was distributed across the north. The strike was part of the UK wide public sector strike against attacks on public sector pensions, attacks similar to those imposed on public sector workers in southern Ireland over the last couple of years. They are part of a Europe wide offensive against the pensions rights of workers. On November 30th the Derry Trades Union Council have called on workers to rally in Derry's Guildhall Square at 1pm. Many Public Workers will be holding pickets outside their place of employment then marching to the Guildhall Square. Occupy Cork invites everyone opposed to the current austerity regime out in force on Saturday, Dec. 3rd. 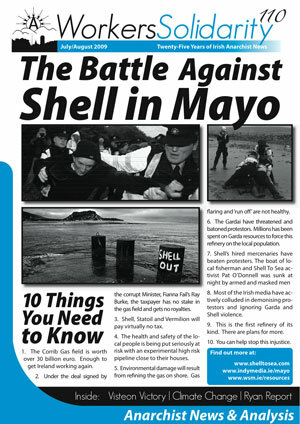 Similar actions on this date will be co-ordinated with Occupy camps in Dublin, Waterford and Galway. A solidarity action from Occupy Belfast has also been proposed. Assembling outside the opera house at Emmet Place at 1:30pm, we will march down the quay, up Patrick St. and down South Mall, back to Emmet Place. There we will hold a general assembly at which anyone can speak. There will be a RAG open meeting on Monday, 7.30pm, 5th December. This facilitated discussion will look at the issue of sexism in the workplace. This event will take place in Sin É, on Ormond Quay, in the basement room. The Spectacle of Defiance and Hope is a broadly based alliance of Community Organisations from Dublin and beyond which is organising a pre-budget protest at Castle Street (off Dame street) from 2pm on Saturday. They say "Please join us as we take to the streets on the 3rd of December @ 2pm to draw attention to the savage economic injustices that are happening in Ireland. Bring your books of Grievances and Hopes which will state clearly the kind of Ireland we all aspire to live in, this is an Ireland of true equality in the conditions of peoples lives." Saturday saw the 2nd Spectacle of Defiance & Hope take place in Dublin, just ahead of the budget cuts that are expected to further devastate community organisations & services. The Spectacle describes itself as a "broadly based alliance of community organisations from Dublin and beyond" and also represents an attempt to break from the standard pattern of demonstrations in Dublin to create something more fun, participatory & engaging. New Beginings a group of lawyers and professionals who have been directly helping mortgage holders in legal battles with lenders, are planning a series of meetings across the state to sign up hard pressed householders to a national campaign. During the upsurge of protest in Egypt ahead of the elections, protests that demanded that the miltary step down and the 12,000 political prisoners be released the WSM signed the following international solidarity statement initiated by the Egyptian Libertarian Socialist Movement on Anarkismo.net. The statement signed by 23 organisations in 20 countries was also published in [العربية] [Català] [Castellano] [Français] [Ελληνικά] [Italiano] and [Danish]. Singer songwriter Christy Moore dropped into Occupy Dame Street in Dublin last night to sing and send grettings to all the Occupy camps in the major cities of Ireland, at Cork, Limerick, Belfast, Waterford, Kerry, Athlone, Galway and the over 2000 Occupy camps world wide. In the video Christy refers to being in the 'Yellow Submarine,' thats the wooden structure built to serve as a kitchen for a camp that is waterproofed with heavy yellow plastic. Christy then sings 'Ride On' before heading off into the night to the applause of the assembled campers. The changes to fees and the maintenance grants system for new postgraduate students in Budget 2012 comes as no big shock. The €250 increase in the student contribution charge means students will pay €2,250 from next September, with other increases likely to come in 2013 and 2014. In relation to the future of the postgraduates, no maintenance grants will be paid for new entrants from the 2012/13 academic year. These changes come into effect, after months of campaigning by the grassroots student campaign group Free Education for Everyone (FEE) and the Union of Students Ireland (USI). This conversation between anarchists from the so-called “peripherals” in the Eurozone, Portugal, Ireland, and Spain took place by timely coincidence on the very day that saw the birth of the Spanish M15 movement. This spread for a period around the globe and was to some degree a precursor or pattern for the “Occupy Everywhere” movement which emerged later this year. On a historical point of interest, in this conversation we also look at the precursor to the M15 movement, the March 12th mass demonstrations in Portugal called by the Geração À Rasca movement. Primary school communities in some of the poorer areas of the country have been left reeling as the extent of savage cuts to the numbers of teachers in DEIS primary schools begins to emerge.